More than 60,000 students, advisors, FFA alumni and exhibitors gathered in Indianapolis, IN, October 19-22, 2016 for the 89th National FFA Convention and Expo. Students from all 50 states attended. Our white shirts stood out in the sea of blue coats. 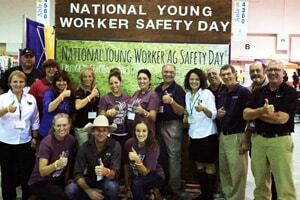 We engaged with over 2,700 bright, polite, young adults who visited our interactive agricultural safety exhibit to test their knowledge and safety strategies on topics spanning from tractors to safe climbing. Materials shared with students and advisors included good stockmanship video information, agritourism health and safety, needlestick safety and U.S. Ag Center Safety and Health video information. Tammy Ellis is an Education Outreach Specialist with the National Farm Medicine Center, National Children’s Center for Rural and Agricultural Safety and Health and the Upper Midwest Agricultural Safety and Health Outreach Project.